Caricature is a type of iconography that involves distorting the features of recognizable people to exaggerate some aspect of their demeanor. Opinions differ regarding the term’s applicability to other than real-life subjects; for example, Walt Disney considered his animated animals to be caricatures because in creating them he blended animal features with human ones, an inversion of the practice of caricaturing people by merging their features with those of animals. 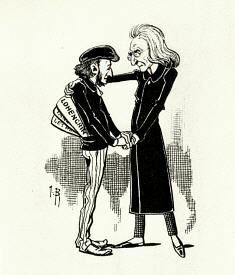 In the caricature reproduced above by Albert Douat (1847–92, signed with the pseudonym J. Blass), Liszt consoles Wagner over the Parisian reception of Tannhäuser in 1861 and Lohengrin in 1891; both productions were disrupted by elements hostile to the composer. Liszt’s imposing stature and paternal attitude—particularly apt since by the time the drawing was produced he was Wagner’s father-in-law—contrasts with the dejected, little-boy look of the creator of Gesamtkunstwerk.